Sometime around 3:45 p.m. on January 1, 1951, Mary Kelly felt the need to visit the chapel at St. John’s Hospital (Springfield). As she knelt in prayer before beginning her evening shift as a nursing student, she realized the reason why she was there - God was calling her to Religious Life. “Whatever it was, it was loud and clear that God was calling me,” Sister Mary said. And she has continued to serve Him as a Franciscan Sister ever since. Sister Mary was born in Kincaid, IL and moved with her family to Nokomis, IL when she was four years old. Her father was a coal miner and her mother was a housewife. One of Sister Mary’s fondest childhood memories was that she and her older brother had supper together every night with their parents. “Our mom was there to greet us every day when we came home from school,” Sister Mary added. She was taught by the School Sisters of Notre at St. Louis Catholic Grade School, Nokomis, and after visiting their Motherhouse in the 8th grade she began to hear God’s voice in her spiritual life. “I did not have the nerve to tell my parents about my feelings and so I ignored it and just went on with my life. Actually, I laughed with my other friends who were thinking about Religious Life but deep down I always thought it was a possibility for me,” she explained. She went on to enjoy high school and participated in sports, chorus, and school plays. When she began to think about career choices, Sister Mary knew that she wanted to be a nurse. She enrolled at St. John’s School of Nursing, Springfield, IL and began her nursing education on September 8, 1949. Two of her high school classmates joined her at St. John’s and they all were excited about beginning their nursing education. While at St. John’s, the nursing students were taught by and worked with the Hospital Sisters of St. Francis. In looking back at the experience, Sister Mary found that her calling to Religious Life was enhanced each day and that the Holy Spirit slowly began to open her eyes to this life. During her freshman year, St. John's provided a weekend retreat at the school of nursing. This experience turned out to be significant in her discernment process. After her powerful experience of hearing God’s voice on Jan. 1, 1951, Sister Mary knew what she needed to do. There was a class of women entering in February but since her brother was entering the military, she did not want to add to her parent’s sense of loss. So she waited and found the courage to tell her mother in April. However, it was not until August 19 that she saw an opportunity to tell her father about her calling. “I wrote in my father’s birthday card, ‘Happy Birthday, Dad…I’m entering the Convent’ and I entered on September 12,” she said with a smile. She did not know much about St. Francis prior to entering the Community but has come to love Francis and Clare. A highlight for her was making the Franciscan Study Pilgrimage in 2004 to Rome, Assisi, and the surrounding areas including the Rieti Valley and Greccio. As she reflected on her 52 years as a Franciscan Sister, Sister Mary has found strength in her sense of humor and always knew that this was where she was supposed to be. She has served as Director of Nursing Service for 18 years in Sheboygan, Streator, and Springfield and in Pastoral Care in Decatur. 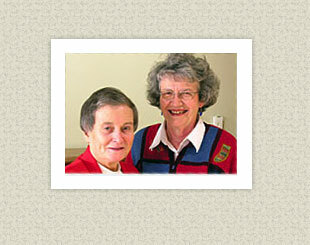 She has also served her Community as the Provincial Vicaress and the Motherhouse Local Coordinator. In addition, she served as the First Vice President of the HSHS Board of Directors and a Nursing Instructor at Marillac College, St. Louis, MO. Currently, she serves as a part-time receptionist at HSHS. Sister Mary is a graduate of St. John’s School of Nursing and received a bachelor’s degree in nursing from Marquette University. She also received a master’s degree in Nursing Service Administration from The Catholic University of America, Washington, DC. “I loved nursing but I especially loved my work with the Sisters over the years. Every day might not be a good day but you need determination and resolve. If a vocation is worth pursuing, then it is worth the bumps in the road,” Sister Mary concluded.